This is a great overnight destination that is easily reached from Melbourne. 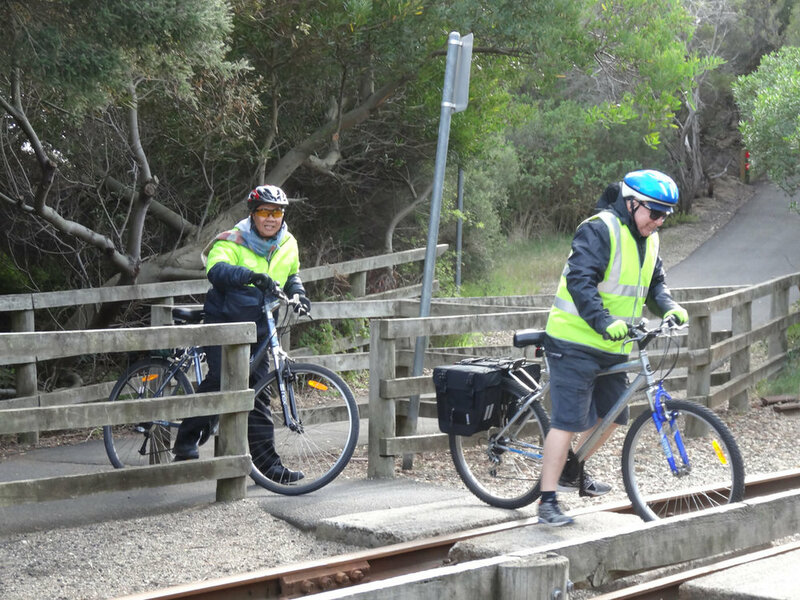 The ride is a return journey from South Geelong Station along the Bellarine Rail Trail. It follows the historic Geelong-Queenscliff railway line, that ran from 1879 to 1976. The actual trail features remnants of native revegetation. After riding amongst houses in Geelong, you will soon leave the city behind and enjoy rural views especially between Melaluka Road and Kensington Road. As you ascend Leopold Hill, enjoy the vistas and look for views of the bay as you ride on to Drysdale. In Drysdale, you can check out the old station. It is still in use with a steam train running between Drysdale and Queenscliff on the Bellarine Tourist Railway. If you are riding on a day when the railway runs, you can take your bike on the train free of charge. This is a particularly attractive option for the return journey from Queenscliff to Drysdale as this is uphill! You need to check when trains are running before planning this option. After Drysdale there are more great views across the peninsula. Look for a camel and a llama as you ride. And watch for the flowerpot people. After all, why throw out your old clothes when they make fine plant pots? At Queenscliff it is worth taking time to enjoy this historic town. There is a maritime and a historic museum and many lovely old buildings to admire. If you have not previously organised an overnight ride, you may like to visit our page Hints and Tips for Overnight Rides. See Variations for side trips from Queenscliff. While there are cafes at the start on Fyans Road, and in Queenscliff, there are not many during the ride and it is best to take your own food. At Drysdale a short ride down a steep hill from the station to the town takes you to a café. There are a lot of options in Queenscliff depending on your numbers, tastes and budget. When our group did this in May 2016 we all stayed at a good B&B and enjoyed a good dinner at the Rip View Bistro at the Queenscliff Bowls Club. There are toilets at South Geelong Railway Station, Leopold, Drysdale and Queenscliff. The trail gently climbs to Drysdale before falling gently to Queenscliff. It is a mixture of sealed and gravel paths. Navigation is pretty straightforward .The trail is well marked and signposted. Crossing the railway line just before Queenscliff. You can take your bike on the train to South Geelong station from Melbourne and other stations between and return the same way. This is best done when it is not peak hour. Most Geelong trains take either up to 6 or 12 bikes per train. So if a lot of people choose to travel by train, some will have to go early and hang around in a café. You can also can drive to South Geelong and park overnight in Strong Street near the start of the ride. Start at South Geelong Station. Ride through the car park and turn left onto Verner Street, right onto Bellarine Street and left into Foster Street. Turn left into Swanston Street and immediately right into Strong Street. Ride down Strong Street and pick up the trail at the end of the street. Follow the trail passing through Moolap, Leopold, and Drysdale, to reach Drysdale Station. From Drysdale Station continue straight ahead passing through Mannerim Siding and Suma Park Station. Be very careful at a number of road crossings. Just after Suma Park Station (at about 30km from South Geelong) you reach Port Arlington Queenscliff Road. Cross this road. Here the trail makes a sharp left leaving the railway line behind and follows the road for 200m before turning right back to the railway line. You next cross Fellows Road and follow the trail alongside Murray Road, Bellarine Highway, King Street and Nankervis Parade. Then cross the railway line and ride to Queenscliff Station. Explore Queenscliff and stay here overnight. On Day 2 return the way you came. There is a shared trail from Queenscliff to Point Lonsdale along the coast that makes a lovely side trip (12km return). Another side trip is to cross to Sorrento on the ferry. Then ride along Point Nepean Road to Point Nepean National Park and explore the park by bike (20km return).